If you don't see the desktop calendar, right-click the VueMinder icon in the task tray and toggle the "Desktop Calendar (Full)" or "Desktop Calendar (Mini)" commands, depending on the type of desktop calendar you want to see. Use the Desktop Calendar commands on the View menu of the main window. 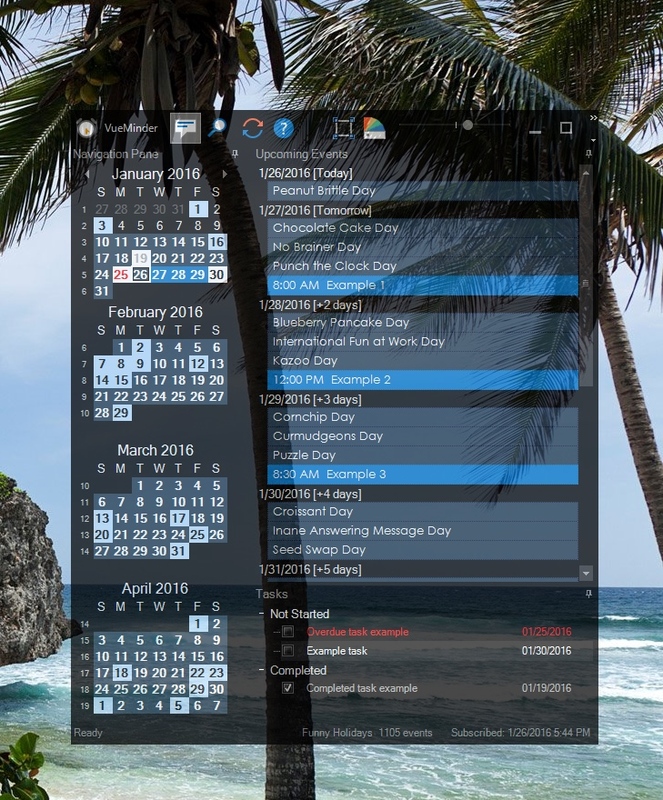 VueMinder integrates a Desktop Calendar into the Windows desktop. This is an interactive, simplified version of the Main Window, providing Day, Week, and Month views. 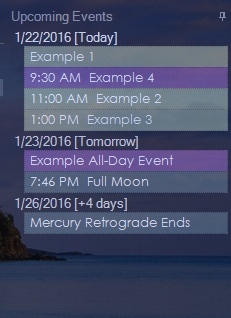 The view type can be selected using the Day, Week, or Month tabs along the left side of the desktop calendar. 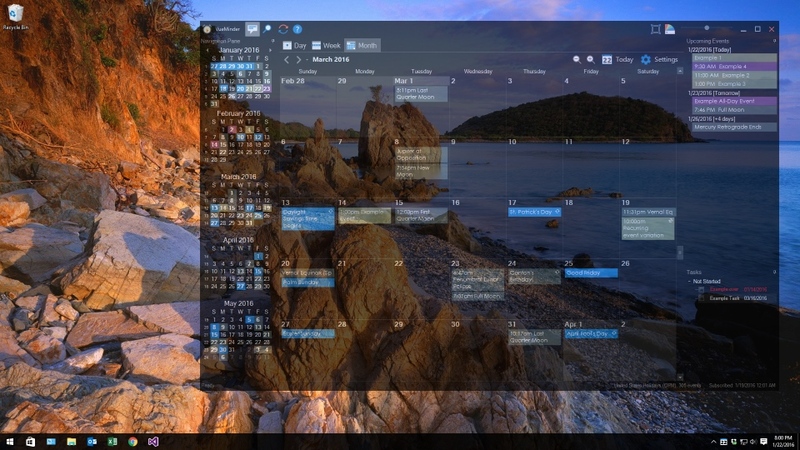 The desktop calendar's size, position, transparency, and appearance theme can be adjusted using the buttons in the upper-right corner. The desktop calendar can be displayed or hidden by toggling the "Desktop Calendar (Full)" option of the View Menu or Task Tray context menu. You can maximize or hide the desktop calendar by clicking the buttons in the upper-right corner of the desktop calendar. A smaller version of the Desktop Calendar is also available and can be selected from the View Menu or Task Tray context menu by clicking the "Desktop Calendar (Mini)" command. A button in the upper-right corner of the full desktop calendar also enables toggling to the mini desktop calendar. To switch back to the full desktop calendar, use the arrow button in the lower-right corner of the mini desktop calendar. The mini desktop calendar shows a single month. Dates can be navigated using the left and right arrows. When the mouse is hovered over a date, a list of events, tasks, and notes for that date is shown. Dates are color-coded based on the associated calendar, category, priority, or location. The mini desktop calendar can be moved anywhere on the screen by clicking and dragging. The opacity of the mini desktop calendar can be adjusted using the Opacity slider at the upper-right corner of the full desktop calendar. VueMinder Main Window - Use this button to display the main window. Sync - This button will sync all calendars. Calendars that are subscribed, published, synced with Google Calendar, synced with Outlook, or shared over a local network will be refreshed. New Event - This button can be used to create a new event on the selected date. The Event Editor will be displayed, where the event title and details can be entered. New events can also be created by double-clicking an empty area in a day. New Task - This button can be used to create a new task due on the selected date. The Task Editor will be displayed, where the task description and details can be entered. New tasks can also be created by double-clicking an empty area in the task list. New Note - This button can be used to create a new note on the selected date. The Note Editor will be displayed, where the note text can be entered. Delete - This button can be used to delete the currently selected event, task, or note. If you accidentally delete an item, it can be recovered using the Undo command on the main window's Edit menu. Open - This button can be used to open the Event Editor, Task Editor, or Note Editor for the currently selected item. Undo - This button will undo the most recent edit operation, which could include accidental dismissal of a reminder, event deletion, modification of an event, etc. Move/Resize - This button will toggle a border around the Desktop Calendar, which can be used to move or resize the Desktop Calendar. When you're done moving the calendar, click this button again to hide the border. Theme - This button enables a different appearance theme to be selected. Over a dozen themes are packaged with the software. Opacity - An opacity slider is located to the right of the "Opacity" label. 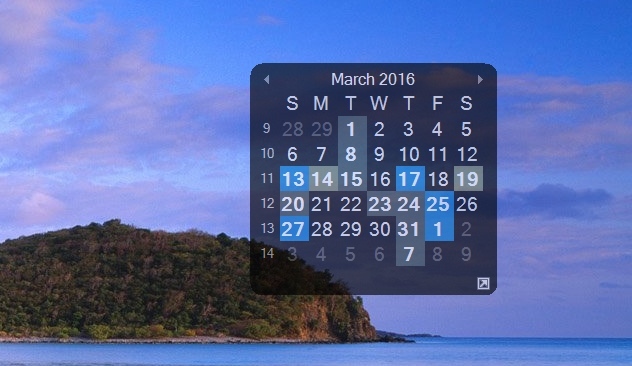 Use this slider to adjust the Desktop Calendar's transparency. Help - Displays this documentation. Mini - Switches to the mini desktop calendar. Maximize - Maximizes the desktop calendar to fill the entire screen. This can be useful if you have a second monitor that doesn't have desktop shortcuts or other widgets. Hide - Hides the desktop calendar. To redisplay the Desktop Calendar, select the "Desktop Calendar" option from the main window's View Menu or the task tray icon's right-click menu. The currently displayed month(s) will be displayed at the top of the Desktop Calendar. You can navigate to the previous or next month by clicking the left or right arrow buttons. You can also navigate to a different date by clicking the date in the Navigation Pane on the left side of the Desktop Calendar. By default, dates are colored based on the first event contained on the date. This behavior can be modified on the Appearance Options window. After clicking a date, it will be displayed in Desktop Calendar. If you'd like to provide more space for the calendar, you can set the Navigation Pane to automatically hide by clicking the "pin" button at the top of the pane. You can also click and drag the "Navigation Pane" text to make the pane float outside of the Desktop Calendar (anywhere on the screen) or dock in a different location within the Desktop Calendar area. Tabs at the top of the calendar view area of the desktop calendar enable selection of the desired view type. The view can be by day, week, or month. Regardless of the currently displayed dates, a list of upcoming events will be shown on the right-side of the Desktop Calendar. These are sorted by date, starting on the current date. The number of days from today's date will be shown to the right of each date label. The maximum number of days will default to 7, but this can be adjusted via the Calendar Options. You can open the Event Editor for a listed event by double-clicking it. If you'd like to provide more space for the calendar, you can set the Upcoming Events list to automatically hide by clicking the "pin" button at the top of the pane. You can also click and drag the "Upcoming Events" text to make the pane float outside of the Desktop Calendar (anywhere on the screen) or dock in a different location within the Desktop Calendar area. A task list shows your task, grouped by status. 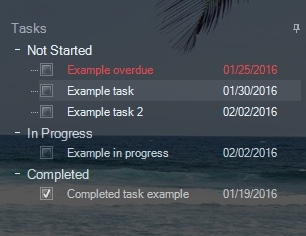 Overdue tasks will be shown at the top, followed by upcoming and completed tasks. You can create a new task by double-clicking an empty area in the task list. To delete a task, select it from the list and then press the Delete key. Tasks can be opened by clicking the ellipsis button next to a task title. Task titles can also be edited inline, by clicking the title and using the keyboard to modify it. A more full-featured task list is provided in the Task List area of the main window. As with the "Upcoming Events" pane, you can set the "Tasks" pane to automatically hide by checking the "pin" button at the top of the pane. You can also drag the "Tasks" text to make the pane float outside the Desktop Calendar, or dock it to a different location within the Desktop Calendar. New events can be created from the Desktop Calendar by double-clicking an empty space in the desired date or time slot. A normal, non-recurring, event will be created. By double-clicking the item. Events will open in the Event Editor window, tasks will open in the Task Editor window, and notes will open in the Note Editor window. If a recurring event is selected, you will be prompted to select whether you want to open the selected occurrence or the entire series. By dragging the event, task, or note to a different date. Click the item to select it, and then hold the mouse button down. Move the mouse to drag the item to the desired date. Release the mouse button to complete moving the item. By resizing an all-day event's box. The event box corresponds to the event starting and ending date. All-day events can have their left and right edges resized to adjust their starting and ending dates. This feature is only available for events, not tasks or notes. Existing events, tasks, and notes can be deleted on the Desktop Calendar. To delete an item, click it to select it. Then press the Delete key on the keyboard. You will be prompted to confirm deletion of the selected item. If the selected item is a recurring event, you'll have the option of either deleting the entire event series, or only the selected occurrence. If you accidentally delete an item and want to recover it, you can use the Undo command in the Edit menu of the main window.